Or more correctly, dip dyeing pennies. I was going through our coin jar with the boys and decided it would be fun to clean some coins. It's super easy and fun to watch. Mix in a clear glass bowl. Toss pennies in for 10-60 seconds (or longer). Rise with cold water. And before I knew it I was half dyeing the coins. I just held the half the coin in the "cleaning pennies solution" for about 30 seconds, pulled it out and washed it in cold tap water. The boys were quickly over the excitement of dyeing coins (they were on to mixing up stuff in my cupboards - see below), but I was just getting started. I was looking through my coins to find birth and anniversary years for my family, so that I could make "lucky us" keychain charms. 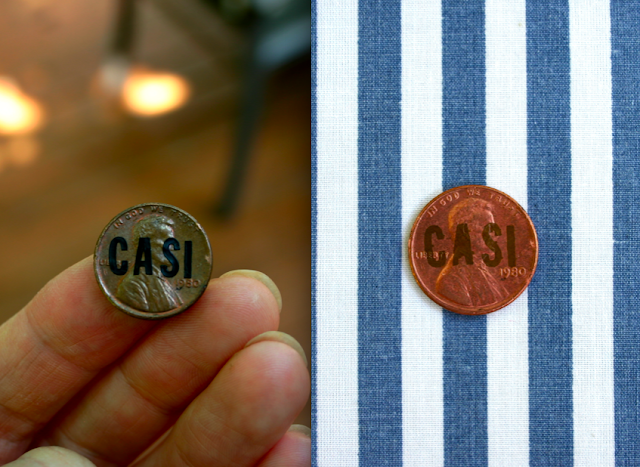 Do you notice the different coin above? I found my sister's birth year and put her name in vinyl letters on the coin. ( I think you could make tape work). I only dyed the coin for about 15-20 seconds because I didn't want the solution to get under the letters. I'm so excited to try this again with initials, fun words, and cool designs. And the awesome part is that I didn't deface the coins (at least I don't think it's defacing), because I was just cleaning them. Let me know if you try this...I'd love to see pics! I'm off to build a fort with Oster before he mixes up another popcorn kernel, balsamic vinegar, ginger, bouillon cube concoction.